Whether you're someone who's gotten to know me from reading my monthly columns in Horse Illustrated or you've sort of just wandered in here through a link on the Horse Channel website, I want to welcome you. Though my Life with Horses column will finish up its run in Horse Illustrated with the December issue, I decided to start my blog today. This way I'll be able to get comfortable with the whole blogging scenario before the magazine column rides off into the sunset. So what's this all about? First, I'll continue to share some of my experiences living with horses in my backyard as well as some of my everyday escapades in my horsey lifestyle. Humor is my objective, as I believe that there isn't enough to laugh at these days, unfortunately. But I also hope to have some thoughtful, poignant things to say as well. 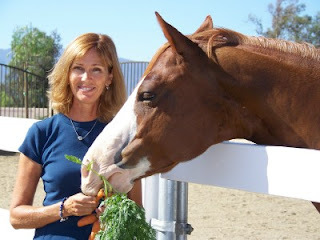 Next, having this blog will allow me to bring up some issues in the horse world. I won't call them rants or tirades-- who wants to read that?-- but about once a week I'll present a personal viewpoint or concern I have related to horses. I doubt you'll find them controversial. But they may get you thinking. And that leads to my final reason for this blog. Very soon you, the reader, will be able to share your thoughts and responses related to my ramblings. I mean my "thoughtful musings." That's it for now. I hear a distinct sound of metal-rattling-against-metal, telling me that Wally the Wonder Paint (that's him in the photo above) thinks it's time for dinner. He's no doubt flipping the snap on his gate in an effort to escape and head for the buffet table on his own. But more about that later.